You might remember my mentioning Perfume from Provence by Lady Winifred Fortescue back in my March Review when I confessed to having broken my Lent book buying ban due to an unexpected train delay. Whilst I felt a little bit guilty at the time (not least because I also picked up the two companion books by the same author which wasn’t strictly speaking necessary) having finished the book I can safely say that never have I been more glad of the wrong kind of leaves on the line. Usually they are the bane of my existence, but in this case they led to me acquiring one of the warmest, sweetest, most delightful books that I have had the pleasure of reading this year. Any qualms I have have felt about picking up the other two books by this author, Sunset House and There’s Rosemary…There’s Rue, have vanished completely as I am certain that I’ll be wanting to read more from Lady Winifred soon. In this book, Lady Winifred writes about her experiences of moving to a tiny mountain village in Provence with her husband, referred to throughout as Monsieur, and the trials and tribulations of dealing with a new country. Not only does she come up against the barrier of language, both French and Italian, but also the completely different culture and way of life there. Her collection of amusing anecdotes about managing the builders, servants and gardeners, dealing with local officials, encountering the dubious honour of being invited to a wedding, and learning to drive on the treacherous mountain roads are all told with a smile, and ability to laugh at herself and a genuine love for the place that is utterly infectious. The illustrations by E. H. Shepherd which accompany the text throughout just make this book even more enjoyable to read. If I hadn’t wanted to visit Provence before, I certainly would after reading Perfume from Provence; as it is, I’m only more keen to go there someday. The section on driving was particularly entertaining, not least because of the way in which Lady Winifred anthropomorphises her cars. There is the gallant English Sir William whom she has had to leave behind and her new little Fiat named Desiree because there is a long period of waiting for the car to arrive from the manufacturers during which she is ‘desiree mais pas trouve‘. But it is the section on driving lessons which is most endearing. My woes at the hands of the DVLA pale into comparison beside a friendly local teaching Winifred to brave the mountain roads by directing her up a precarious, winding track, completely unprotected from a long drop into the valley below on one side, which turns out to be a one way street running in the opposite direction to that in which she is driving. Of course, she only learns this on meeting a rather surprised car coming straight towards her. 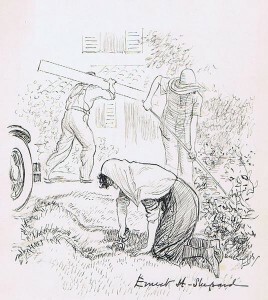 I also loved the account of how one of Winifred’s friends accidentally runs over her garden while Winifred is giving her a lesson and all the servants are enlisted to try to disguise the damage before the gardener notices, after which they gleefully conspire to deny all knowledge of noticing anything happening. Perfume from Provence is such a happy book, full of laughter and fond nostalgia, and I wouldn’t hesitate to recommend this relaxing, amusing tale of French rural life as seen through the eyes of the bemused but affectionate English to anyone at all. 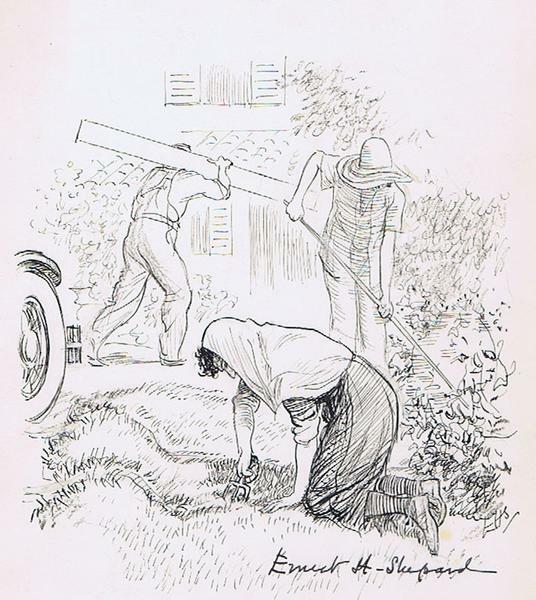 Perfume from Provence by Lady Winifred Fortescue. Published by William Blackwood and Sons, 1947, pp. 274. Originally published in 1935.